Abundant Water is made up of people from all walks of life, working from our head office and in the field. Together, our team works tirelessly to develop sustainable access to clean water. Sunny founded Abundant Water in 2008. In the years since he has been on the ground in project countries such as Laos and Nepal, refining filter systems and growing the social businesses. He is continually inspired by the human spirit’s capacity for practical creativity and to link across the world in order to overcome global obstacles. Stuart was instrumental in founding Abundant Water in 2008 and is dedicated to developing a culture of innovation and enterprise. He trained in Zen Buddhism and Eastern medicine, works in Health Care and Conceptual Art, and has extensive experience in community organisations. Neha brings her wealth of experience in chartered accountancy and professional services as treasurer of Abundant Water. Being born and raised in India, Neha saw how difficult life can be for a lot of people in this world. Realising how lucky we are to live in Australia, she is passionate about giving back to the global community to help the less fortunate. Michael served as an army officer for over 30 years in a variety of diverse locations overseas. He is currently an advisor on environmental compliance in the military and government sector. Michael has seen how difficult it can be for communities to have access to safe, clean drinking water and is committed to the Abundant Water approach of capacity building and empowering local people. 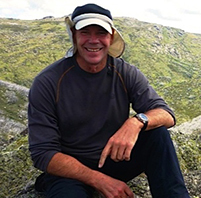 Tristan initially studied freshwater science and has since worked on catchment management, aquatic ecosystems and GIS projects, and currently with the Murray Darling Basin Authority in Canberra. Tristan's understanding of water and sanitation in international aid grows from living and working in Laos and Vietnam. Tristan uses his extensive skills to develop Abundant Water’s field programs. Jennah leads the Volunteering Directorate to bring the best people to Abundant Water. Jennah works in the field of global learning and is passionate about providing young people with transformative learning opportunities through intercultural experiences. Jennah was drawn to Abundant Water’s focus on reflective action, and it’s mission to bring local and international knowledge together for the benefit of all. Liam is the Director of Communications at Abundant Water. Liam has diverse strategic communications experience, having worked as a speechwriter in Federal Parliament, as a Consultant with KPMG and most recently at Newgate Communications where he supports an array of communications efforts across federal, state and territory levels. Liam is keen to help Abundant Water tell its story to the wider community. Mark is a CPA-qualified accountant with experience working in Australian government agencies, NGO's in Namibia, South Africa and Tanzania and with the United Nations working with Palestinian refugees in the Middle East. Mark has dedicated his career to improving the livelihoods of the disadvantaged and vulnerable, and believes in the social enterprise approach of Abundant Water to partner with communities to provide access to clean water. Originally from Denver, Keith is the Abundant Water Program Manager and joined us in 2017. He brings years of experience working in the region as an International Director for school leadership trips and Peace Corp volunteer and a masters in International Development. Nukham has been with us since the beginning in 2008. She is a founding member of Abundant Water and our kiln master, and the years of pottery expertise she brings is invaluable. Nukham is married and has 2 children and 1 grandchild. Thai has been with Abundant Water since 2013. 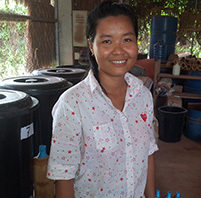 She is rarely without a smile that brings serenity to the workplace and binds the Abundant Water family together. Importantly, Thai helps train new potters and assits in the monitoring and evaluation of our projects. She is married and has a young son. Por Chang has worked for Abundant Water since October 2016. His favourite tasks at work are flow rate testing, and making the cement part closing the filter. He is discreet and meticulous, and strives for quality craftsmanship. July comes from France with a background in agricultural international development and WASH. She has worked in various countries such as India, France, Comoros and Mexico, helping small and medium sized organizations empower local populations. Kek has been working for AW since March 2017. Her daughter used to work for AW in 2013, and she took over from her. She is very friendly and her smile and jokes bring good vibes in daily work tasks. Kamkheo studied English at University and is now working for AW since the beginning of February 2018. He uses his English skills to facilitate the communication between staff members, managers, volunteers, and potential visitors. Tom hails from Canberra where he has spent the last few years finishing his degree at the Australian National University. Upon graduation, Tom approached Abundant Water about the possibility of volunteering and joined the grant applications team. He successfully applied for a position with the team in Laos and arrived in April 2018. Tom loves to travel and aims to eventually complete a Master's degree with hopes to land a job working in development overseas.